This is an editorial dealing with my theories about the basic anatomical structure and capabilities of two of Seru’s most commonly seen traits, his regeneration and absorption capabilities. First appearing during his fight with Juurokugou but occurring several subsequent times is perhaps the single most influential ability that Seru assimilated from the cells of Pikkoro is his regeneration ability. While inherently a Nameksei-jin trait shown multiple times throughout Dragon Ball and Dragon Ball Z, Seru’s use of the regeneration technique is far more advanced, being able to completely restore his body if only a small portion of his person survived. While it was established near the end of the Seru Saga that the portion of his body that would need to stay intact in order for him to regenerate is a small lump of tissue within his head (for the sake of this editorial I will be referring to it as a node), there is an instance during the course of the Seru Saga where it may be concluded that this regenerative node is not the only one. I am speaking of when Seru regenerated himself after the entire upper part of his body was destroyed by Gokuu’s Shunkan Idou Kamehameha combination. I have theorized that Seru actually has two regenerative nodes in his body, a primary one located in his head, as well as a secondary one located in his lower abdomen (after all, it would be rather foolish of Dr. Gero to create what is supposed to be the perfect fighter with such an obvious weakness). The picture shown below shows where I estimate these two nodes are located. The function of the primary node is rather obvious, which is to handle all the regeneration requirements Seru would need in order to continue functioning as long as it remains intact. However, as seen during the Seru Saga, there are times in which the upper part of the body (and thus the primary node) becomes damaged or destroyed, in which case the secondary node would activate. The secondary node is probably a lesser-developed node than the primary one, only activated when the primary one becomes unable to regenerate the body (whether being simply damaged or completely destroyed). There is most likely a neural connection between the primary and secondary node that keeps the primary one active and the secondary one inactive. If something were to cause the connection between the two nodes to be severed, the secondary node would undertake the primary node’s job and regenerate all damaged parts of the body (including the primary node). Once the new primary was formed and the neural pathway re-established, the secondary node would once again become inactive. One of the few techniques/ abilities that was not taken from the cells that comprise him is Seru’s absorption ability. Seru has shown two different versions of his absorption ability, and which one he employs depends solely on how he wants to utilize their power. His first form of absorption is a direct piercing of the body using the hypodermic needle-like appendage at the tip of his tail. By this method, Seru absorbs the ki into his body, thus effectively increasing his own ki (and thus his strength). 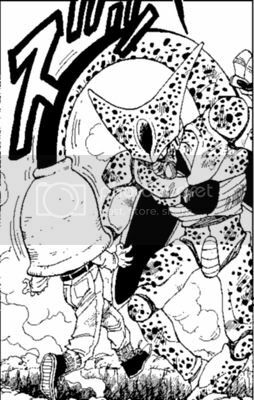 However, this method seems inefficient, for there is likely a limit to how much ki he can contain, as well as absorbing ki in this method is not sufficient enough to cause him to transform into a more powerful state. It is sufficient enough however to allow great strides of power in his initial form. Picture shown below depicts the needle-like form of this appendage. 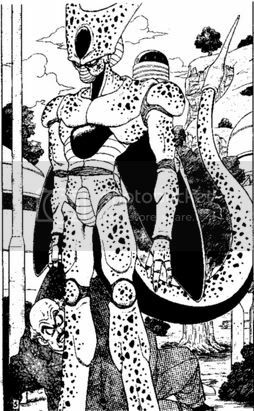 My theory is that Seru’s body, after absorbing one of them, will incase them in some sort of stasis pod (similar to the cocoons Buu keeps his absorptions within) which serves to not only keep them connected to Seru in order to draw on their power but to also keep them in a miniature form. 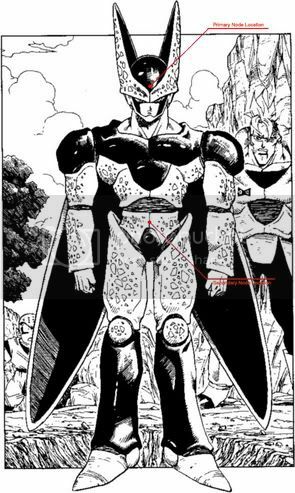 These pods are most likely housed in the lower abdomen of Seru’s body near the secondary regenerative node (for Seru remained in his Kanzentai form after taking the Kamehameha blast to his upper body), yet his brain controls the regulation and control of these pods. This can be concluded during the battle between the battle between Ssj2 Gohan and Kanzentai Seru’s bulked up form, as Gohan is shown delivering a kick to Seru’s head, after which he appears to be physically damaged to quite an extent (he goes cross-eyed and begins to stagger around while shaking uncontrollably). Seru is then shown vomiting Juuhachigou (who is her normal size). For Juuhachigou (and Juunanagou) for that matter, to be within Seru’s body (which for the most part is not that much bigger than they are), they are most likely shrunk down to a very small form, and their stasis pods keep them that way. It is only when the regulator for these pods are damaged that they start to return to their normal size, at which point Seru is forced to regurgitate them. My theory continues by saying this, since Juuhachigou was the newest person absorbed, her pod was the first to stop functioning (which is why Seru vomited her out instead of her brother). After she was expelled and Seru’s body regressed to his 2nd form, the primary node managed to regenerate the damaged connection, thus explaining why Seru did not regurgitate Juunanagou as well.